The constellation Northern Crown, also known in latin as Corona Borealis, is a constellation north of the celestial equator. The brightest star that can be seen clearly with the naked eye, is the star Gemma. The name of this constellation was made up by the ancient Greeks, who recognized a crown. The Arabs in turn indicated the constellation completely different and saw in it the key of a beggar. This is a relatively small constellation located between the Hercules (left) and Boötes (right). 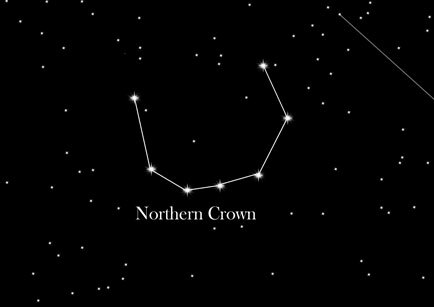 The stars of the Northern Crown are kind of a semi-circle. Only the main star is bright, the other stars are only the fourth size class. To really see this constellation is difficult, but absolutely worth it on a dark night sky. The legend of Ariadne, the daughter of King Minos of Crete, helped the hero Theseus with a thread out of the labyrinth after he had defeated the Minotaur. Both were a couple in love, but the love did not last long and Theseus left on Naxos back. The god Dionysus took pity on Ariadne and married her. At the wedding he gave her a precious diadem, which he continued after her death at the sky. Here it shines today as Northern Crown.